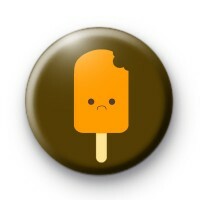 Sad Lolly Pop Badge in brown with an illustration of a cartoon lollipop looking sad because someone has taken a bite out of him. This is a kawaii inspired Japanese style illustration badge of an ice lolly and a must for fans of Japanese animation & Japan in general. We have a good range of kawaii inspired & Japanese inspired button badges on the website. Have a browse through our categories or use the search bar to search for your favourite designs. 25mm button badge made by hand in our UK workshop.